Below are the official 2017 Hockomock League Girls Basketball All Stars, selected by the coaches in the league. For the first time since the inaugural HockomockSports.com Charity Basketball Classic, a pair of seniors won the Three Point Contests. Mansfield’s Phil Vigeant and North Attleboro’s Ashley Ahern came away with the hardware at Mansfield High School, edging out Taunton’s Tommy MacLean and Attleboro’s Julia Strachan in the finals. Both Ahern and Strachan put on a show in both rounds. Strachan had the highest total of any shooter – male or female – in the first round, connecting on 19 shots from beyond the arc. Ahern wasn’t far behind, hitting 17 trifectas to advance to the finals. In the final round, Ahern caught fire and hit an impressive 20 shots (on 25 tries) to edge Strachan (16 makes in the final). 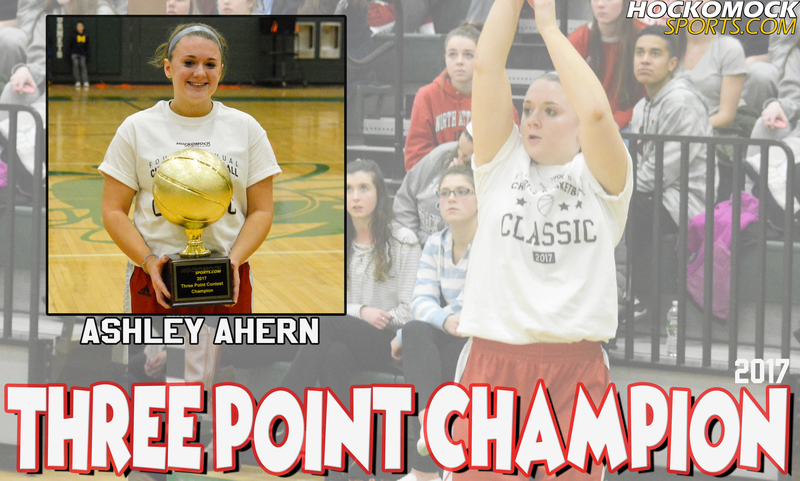 Ahern set the record for most three’s made by a female (20) in a round and tied Mansfield’s Ryan Boulter for most makes in a round for either male or female. Her total of 37 shots made between two rounds is also an event record. Only North Attleboro’s Brent Doherty (39) made more in 2016, but went to overtime in the final. On the boys side, Vigeant had the top score in the first round with 16 shots made. MacLean made the final with 15 made shots, just edging Stoughton’s Matt Valle (14). In the final, Vigeant hit his very last shot to get 14. MacLean hit his final three shots but came up just short with 13. 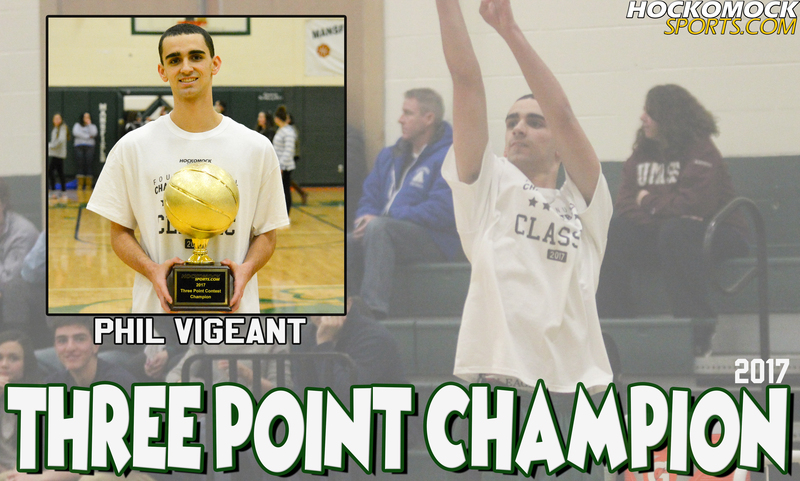 Though MacLean came up short in the final, he now holds the record for all-time shots made in HockomockSports.com Three Point Contest History. In four years, MacLean has drained 65 trifectas. North Attleboro’s Brent Doherty sits in second all time with 62 while Boulter is third overall with 44. Sharon’s Jimmy Fitzhenry hit 12 shots in the first round, setting a new school record for a male player. Valle’s 14 threes is also a Stoughton record for a male shooter. Click here for a photo gallery of this event. MANSFIELD, Mass. – As the final seconds ticked off and Attleboro sealed its first round win against Brockton on Tuesday night, the Attleboro student section started a “We want Mansfield” chant, directed at the Hornets who had come to watch the game as a team. After two losses to the Hornets in the regular season, the Bombardiers believed that the third time would be the charm. After three quarters of Thursday’s Div. 1 South quarterfinal in the Albertini Gym, it looked like Attleboro may just pull off the upset of the league champion and top seed. That was when Mansfield senior guard Jen Peelstarted to get going. Peel scored eight of her team-high 14 points in the fourth, Mansfield’s final eight points of the game, and helped the Hornets gut out a 33-31 victory, earn a three-game sweep of the season series, and advance to the South final for the third season in a row. With the Hornets trailing by three to start the fourth, Peel drew the defense and found an open Ann Maher for her second three of the game to tie it. On the next possession, Meg Hill tracked down the rebound of a wild three by Peel and then fed it to the guard who drove to the basket for a layup. After Attleboro tied it with a layup by Sarah Deyo (five points, 14 rebounds), Peel used a pump fake to get her defender to fly by and drilled her second three of the night to make it 30-27. Following a hustle rebound by Deyo, Julia Strachan (14 points) answered with her fourth three of the night to tie the game again with 3:50 remaining. Again it was Peel that had the response for the Hornets, getting around a double screen into the corner and drilling her third from beyond the arc for what turned out to be the game-winner. Deyo made one of two from the line and Attleboro had several chances on drives to the basket but were not able to get the tying basket. With one last chance, the Bombardiers tried to get the ball into Deyo at half-court, but it was tipped by Hill and chased down by Mady Bendanillo to seal the win. Peel started the game with a deep three that prompted Attleboro to switch over to a triangle-and-two defense. After scoring four points, Hill picked up her second foul and sat for the rest of the half. Shortly after, Maher joined her on the bench as well, but Mansfield held the 9-4 lead after the first quarter. With two key players on the bench, the Hornets went cold in the second, shooting 0-for-14 from the field and scoring only four points on 4-of-8 from the line. Also, with Maher on the sidelines, Strachan got loose and found the range from deep. Strachan buried three from beyond the arc in the second and Jordyn Lako added a basket and an assist. The visitors led 17-13 at the half and Mansfield was looking for someone to knock down shots. “All of a sudden you’re asking kids who haven’t taken a lot of shots all year to take big shots in a quarterfinal game,” said Redding of the struggles offensively for the Hornets against the Attleboro defense. Stephanie Kemp hit a jumper to get the third quarter started, but Grace Mayer knocked down a three off a Deyo assist to extend the lead to five. It was the largest lead for either team in the second half. Maher got free for a three-pointer and then Hill snagged an offensive rebound on the baseline and with the shot clock buzzer about to go off hit a 13-foot jumper that gave Mansfield the lead. Lako made sure it was short-lived, as she nailed a three on the other end to give Attleboro a slim lead heading to the fourth. She also scored on a layup to open the final quarter. The loss ended a remarkable career for Deyo, who finishes as the program’s all-time leading scorer with 1,341 points. Despite being on crutches before the game, after suffering an injury against Brockton, she still managed to pull down 14 rebounds and block three shots against the Hornets. Mansfield (19-2) will face No. 4 seed Wellesley in the semifinal at Massassoit Community College in Brockton at a date and time to be determined. ATTLEBORO, Mass. – Entering the state tournament, Attleboro had been struggling to find the consistent form that got the Bombardiers off to an 8-0 start to the season. Blown leads and close losses in rematches against Franklin and North Attleboro in the final week highlighted what was a 7-7 run over the last 14 games. In the fourth quarter of Tuesday night’s playoff opener against Brockton, it seemed like Attleboro would once again struggle to pull out a win in a close game. The Boxers rallied from as many as nine points down in the second half to take the lead on a Jade Wilt (10 points) jumper with a minute remaining. This time, Attleboro did not fold. Senior guard Julia Strachan capped off a 24-point night by driving up the court and pulling up for a jumper with her toe on the three-point line that put the Bombardiers ahead 59-58 with 57.4 on the clock. A pair of free throws from Sam Pierce (11 points, six rebounds) and two from Jordyn Lako (six points) sealed a 63-58 victory for Attleboro, which avenged a first round playoff loss to the Boxers in 2014 and sets up a third meeting with league champion Mansfield, the top seed in Div. 1 South. The Bombardiers needed Strachan to be on fire early, as Attleboro was slow out of the gates against an aggressive Brockton team that dominated on the glass and in hustle plays for much of the first half. Strachan had nine of Attleboro’s 14 first quarter points, but the Boxers held an 18-14 lead after one. The challenge was not accepted right away and, after a layup by freshman Alexandra Giannaros (team-high 14 points), Brockton led 28-20 in the closing stages of the second quarter. Attleboro finally responded with eight straight points to end the half tied. Pierce drilled a three and scored off a nice bounce pass by Grace Mayer (three assists). Pierce then assisted on a basket by Sarah Deyo, who added a free throw to even the scores. The Bombardiers came out of halftime determined to grab the lead and to gain control of the glass. Deyo scored 10 of her 18 points in the third, twice scoring on offensive rebounds and also a three-point play on another Mayer assist. Deyo started to dominate the boards and finished with 19 rebounds. Strachan nailed her third three to put Attleboro ahead by five, then Pierce scored off an inbounds pass by Mish Logie, and Madison Brown came off the bench to snag her only rebound and turn it into her only basket to push the Bombardiers in front by as many as nine. The lead was six heading to the fourth, as the Boxers just would not go away. Jalani Jackson (12 points) assisted on a three by Makayla Robinson to start the final quarter, but that was quickly answered by a long-range shot by Strachan, who also matched a three by Wint to keep the lead at eight points. Brockton crept back into the game at the line. The Boxers went on a 9-0 run to take the lead for the first time in the second half and were helped by going 7-for-8 at the line, including two clutch free throws by Giannaros that cut the Attleboro lead to one. Strachan provided the heroics for the Bombardiers and sent Attleboro into the next round for a heavily-anticipated third meeting with Mansfield. The Hornets won both meetings in the regular season and there is little mystery between these rivals. He smiled when asked if there was anything specific that the Bombardiers would try to do differently the third time around. “Score more points than they do,” he quipped. Attleboro (16-7) will travel to Albertini Gym on Thursday night at 6:30 to face Mansfield (18-2). Six girls’ basketball teams will begin their quests for a state championship when the state tournament begins this week. League champions Mansfield (Div. 1 South) and Foxboro (Div. 2 South) both earned the top seed in their respective brackets, but neither will have an easy road with league rivals like Attleboro, Oliver Ames, and North Attleboro posing major threats to bringing home a trophy. Milford will also represent the league as the lone Hock team in Div. 2 Central. As usual, Div. 1 South is a loaded bracket with some of the top programs in the state, including defending state champion Bishop Feehan and perennial powers Braintree and Newton North. Mansfield (18-2) earned the top seed in a coin flip with the Shamrocks, who beat the Hornets in an exclusion game during the regular season. More important than the seed, Mansfield will now avoid the Shamrocks, the Wamps, and the Tigers until the South final. 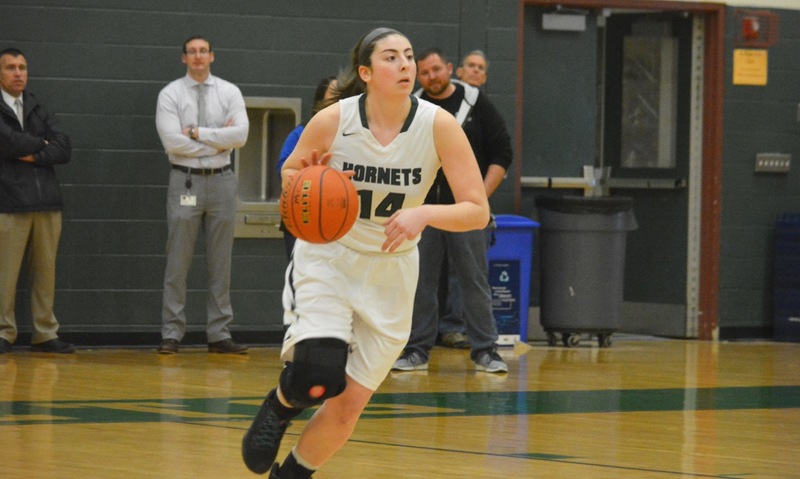 Led by senior guard Jen Peel and junior center Meg Hill, the Hornets like to slow the pace down and focus on strong defense, which held teams to a league-best 38.0 points per game. Mansfield is young this season, but deep and versatile and head coach Mike Redding’s squad should match up well against the teams on its side of the bracket, including potential semifinal opponents Wellesley or Marshfield (which Mansfield beat 52-47 in December). In order for the Hornets to get to the semifinals, they may have to go through Kelley-Rex rival Attleboro (15-7), which claimed the No. 8 seed and will host Brockton (Attleboro beat the Boxers 63-55 in December). The Bombardiers have scuffled down the stretch, losing seven of its final 14 games of the regular season, but closed it out by putting 94 points up on Durfee in the season finale. 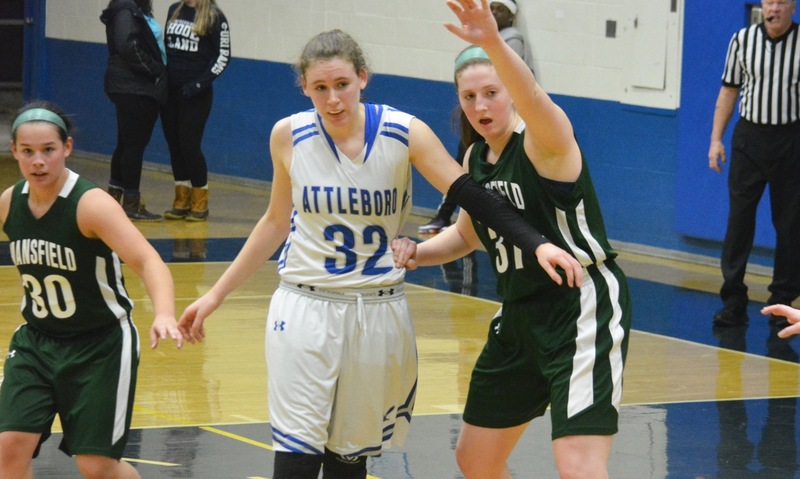 With seniors Sarah Deyo and Julia Strachan, Attleboro has a potent inside-out combo and has been one of the top offensive teams in the league this year, averaging a league-best 61.4 points per game. The issue for the Bombardiers will be trying to slow down Jen Peel and Mansfield in the quarterfinal, if they can get past a dangerous Brockton team in Tuesday’s playoff opener. Attleboro struggled in two losses to Mansfield in the regular season, but will be hoping third time is the charm to set up a potential rematch with Wellesley, which knocked the Bombardiers out of last year’s tournament. 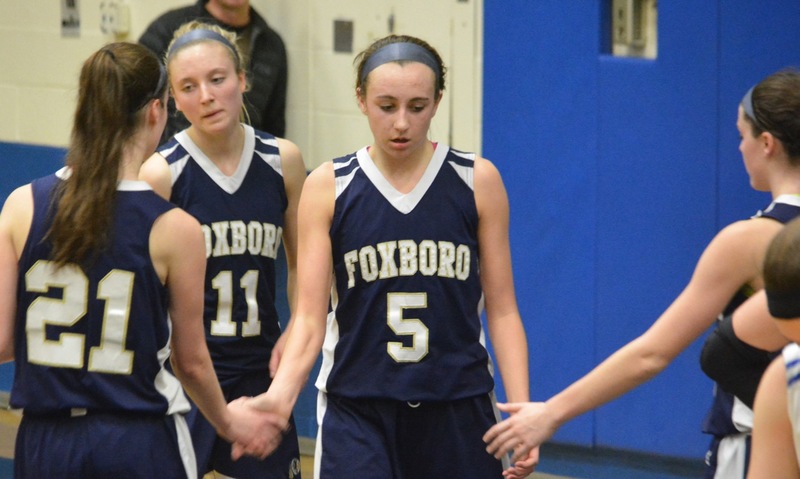 Foxboro (18-2) has been on fire to close out the season, winning 12 in a row entering the playoffs, including a 20-point win over North Attleboro to claim the league title and an impressive overtime win over Lincoln-Sudbury in the end-of-season tournament. The Warriors will be led by league MVP Ashley Sampson, who scored 31 in that win over L-S and nailed a three-pointer that forced OT, but a strong supporting cast includes Lily Sykes and Grace Tamulionis. The scary part is that all three are juniors and will be back next winter as well. The Warriors will not have an easy path in Div. 2 South, which is another loaded bracket, and will have to face one of the two finalists from 2016, either Hingham or Oliver Ames, in the quarterfinal and could potentially face the Rocketeers for a third time in the semifinal. Westwood, Nauset, and Falmouth, which knocked Foxboro out of the tournament last year, could wait in the sectional final. Oliver Ames (13-7), the defending Div. 2 South champ, has had an up and down first season in the Kelley-Rex but managed to claim second in the division and is a sleeper to retain its South title. The Tigers will have a very difficult road to try and repeat with a trip to last year’s South finalist Hingham waiting in the first round and a potential meeting with Foxboro looming in the quarterfinal (the Warriors won the league meeting between the teams 51-35). Kayla Raymond will be the focus of all of OA’s opponents, but trying to slow down the junior forward is easier said than done. If the Tigers can get support for Raymond from senior Niyera Mitchell and find consistent outside shooting, then OA will be a tough matchup. Losing sophomore guard Sadie Homer during the season and senior Francesca Calabraro prior to it has made things tougher but no one will take head coach Laney Clement-Holbrook’s team lightly. North Attleboro (16-6) is another sleeper in Div. 2 South. Last year, the Rocketeers were knocked out in the first round by OA on a last second Raymond basket and could have made a similar run to the Tigers if they had made it through. This year, North comes in with six losses, but only one to a team in Div. 2 and that was the league final against Foxboro. Despite missing senior guard Ashley Ahern to injury, North earned an impressive come from behind win against Attleboro in the final week and has the potential to make a deep run this year. The Rocketeers are loaded with experienced seniors, including forward Caroline Collard and guards Samantha Taggart and Emily Schromm, who have shown the ability to win close games against good teams this season. North beat Foxboro in the first meeting, beat Oliver Ames by one, and has also beaten potential tourney opponents Hingham and Westwood this year. North faces Madison Park to start and likely will face Duxbury in the quarterfinal to try and get a rubber match with Foxboro in the semifinal. Milford (10-10) qualified for the tournament for the first time since 2012 and has shown immense progress in head coach T.J. Dolliver’s second season in charge. But, the Hawks have also struggled down the stretch, albeit against a tough stretch of league opponents including North Attleboro and Foxboro twice, OA, and Attleboro. The Hawks will be in Div. 2 Central and will likely face Marlboro in the playoff opener, which is a team similar to the Hawks that shoots a lot of threes and does not have a true post presence. The Hawks will be counting on a big game from junior guard Kate Irwin, who has been among the league’s top scorers this season, but Milford has a lot of versatile players that can cause teams problems on the perimeter and in the paint, including senior Nicole Dahlgren. If the Hawks do get through the first round, then they will travel to No. 3 seed Groton-Dunstable and could face a couple of Eastern Mass. transplants in Hopkinton and Medfield. Franklin, 73 @ Attleboro, 65 – Final – Franklin built a 10-point lead heading into the final quarter and held off the Bombardiers to earn the win. Attleboro cut the deficit to five on two separate occasions, including with just under a minute to play but the Panthers finished the game strong. Connor Peterson had 16 points while Josh Macchi and Paul Mahon each chipped in with 14 points for the Panthers. Foxboro, 51 @ Canton, 44 – Final – It was a close contest throughout between the two Davenport rivals, with Canton seizing a 14-10 lead after one and Foxboro 26-23 at half and 34-33 heading into the fourth quarter. The Bulldogs cut the deficit to one with less than a minute to play but Foxboro senior Andrew Block drained a three to put the Warriors ahead for good. Block scored eight of his 11 points in the final quarter while Joe Morrison scored 13 points, Mark Clagg had nine points and both Brandon Borde and Jamaine Few each had eight points. Canton sophomore Devin Foster had 13 points and junior Tony Harris added 10 points. Mansfield, 56 @ King Philip, 53 – Final – Mansfield senior Sam Goldberg (six reobunds) scored 17 of his game-high 29 points in the second half, helping offset a poor shooting night by the Hornets to clinch at least a share of the Kelley-Rex title. Mansfield shot just 3-23 from three point range with only Max Boen (11 points) connecting from deep. Goldberg scored 11 points in the third quarter to give Mansfield a 43-36 lead heading into the fourth. The senior scored six of the team’s 13 points in the final quarter. Evan Christo added 11 rebounds for the Hornets. Oliver Ames, 73 @ Taunton, 61 – Final – Click here for a recap of this game. Sharon, 81 @ Stoughton, 72 – Final – Sharon junior Malik Lorquet had a monster night for the Eagles, tying a career-high with 17 points while hauling in 13 rebounds and adding four steals and three blocks. 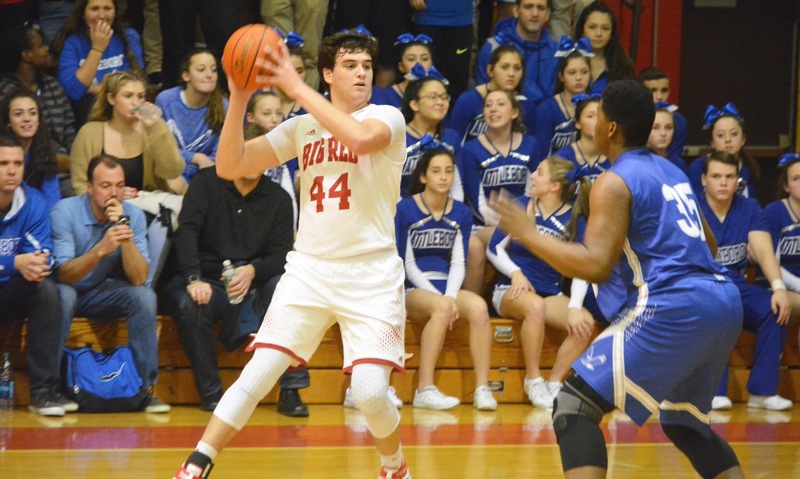 Senior Jimmy Fitzhenry had a team-high 18 points while classmate Danny Emerman finished with 12 points. Stoughton junior Cam Andrews scored a game-high 24 points. Attleboro, 52 @ Franklin, 59 – Final (OT) – Franklin rallied late in the game to force overtime and outscored Attleboro 16-9 in the extra period. Carli Koffinke buried a pair of threes (her only two of the game) and Bea Bondhus scored five points in OT to lead the Panthers, after the duo combined for only one point in regulation. Freshman Ali Brigham was the game’s top scorer, leading the Panthers with 21 points, and classmate Megan O’Connell added nine points in the win. Julia Strachan led the Bombardiers with 18 points and Sarah Deyo had nine. 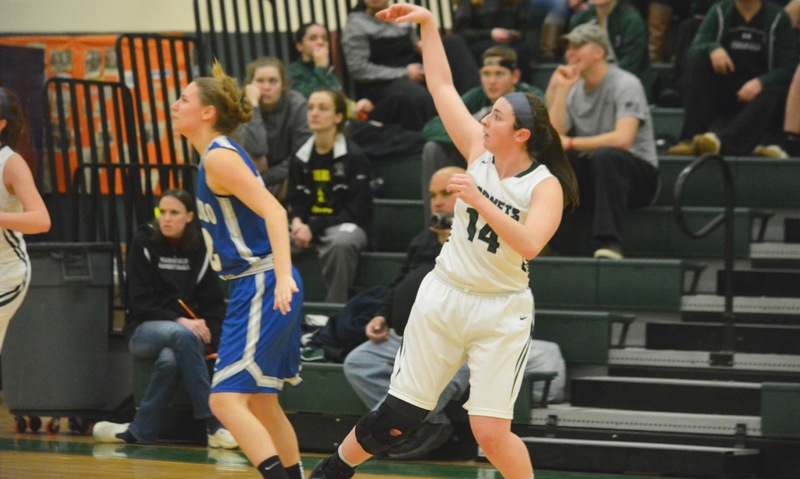 Canton, 28 @ Foxboro, 69 – Final – After scoring 31 on Monday night, Ashley Sampson scored a team-high 17 on Tuesday to ensure that Foxboro will go into the final league game in at least a tie for first place in the division. Kristen Bortolotti scored 16 points and Riley Collins had 11 for the Warriors. King Philip, 33 @ Mansfield, 52 – Final – Junior Ann Maher paced the Hornets with a game-high 14 points. Sophomore Emily Vigeant chipped in with six points and Jen Peel added 12 assists for Mansfield, which had 11 players score in the game. Julia Leroux and Christina Hathaway each scored seven points apiece for the Warriors. Milford, 55 @ Hopedale, 37 – Final – With the victory, Milford booked a place in the state tournament for the first time since 2012. Taunton, 20 @ Oliver Ames, 54 – Final – Oliver Ames had another impressive defensive effort while junior Kayla Raymond scored a game-high 11 points. Niyera Mitchell and Hannah Carroll each had nine points for OA. Stoughton, 59 @ Sharon, 45 – Final – Stoughton was led by a pair of freshmen against the Eagles. Aliyah Wright scored a team-high 17 points, while Shyanne Trinh added 15 points for the Black Knights. Stoughton, 5 vs. Bellingham, 2 – Final – Stoughton senior Jon Lessa netted a hat trick to pace the Black Knights past Bellingham. Brendan Campbell and Josh Hough also found the back of the net for the Knights. Mansfield/Oliver Ames, 4 @ Franklin, 2 – Final – Cat Luciano scored a hat trick for the Warriors and Madison Haughey scored the fourth. MANSFIELD, Mass. – Last winter Mansfield edged Attleboro on the final night of the league campaign to earn the program’s second Hockomock title. Coming into this season, the Hornets were young with only two seniors on the roster and a host of talented, if inexperienced, underclassmen. Hornets coach Mike Redding knew his team would still be good, and would get better over the course of the season, but he had no idea that with three games left to spare Mansfield would have the chance to win back-to-back titles for the first time in program history. That is exactly what the Hornets accomplished on Monday night. Led by senior point guard Jen Peel, who scored a game-high 21 points and pulled down seven rebounds despite being the focal point of the Attleboro defense, Mansfield pulled out a 54-47 victory in the James Albertini Gym to sweep the season series against the Bombardiers and clinch at least a share of the Kelley-Rex title. Peel came out firing and buried a pair of threes, as the Hornets jumped out to an 8-0 lead in the first quarter. She added seven points in the second to give Mansfield a halftime lead and in the fourth quarter Peel knocked down the final two of her five three-pointers on the night to extend the Hornets’ lead to as many as 11 and seal the victory. Mansfield got off to a quick start in the first, but Attleboro answered back with an 11-0 run take the lead for the first time. Julia Strachan found Sarah Deyo open in the corner for her second three-pointer of the quarter and a piece of program history. With that basket, Deyo recorded her 1,222nd career point, which moved her past Becky Hardt (Class of 1994) on the school’s all-time scoring chart. Deyo, who finished with 17 points and 17 rebounds on the night, is now the highest scoring female player in Attleboro history. After Deyo’s slice of history, Kara Bendanillo answered back with a three of her own to tie the game at 11-11. Following a pair of free throws by Sam Pierce (eight points), Bendanillo drove and kicked a pass to Meg Hill (eight points, eight rebounds) for a 15-foot jumper that tied the game at 13 apiece after one. Despite being in the double bonus for the majority of the second quarter, Attleboro struggled to get consistent offense. Strachan was held scoreless for the entire first half and Deyo had no points in the second. 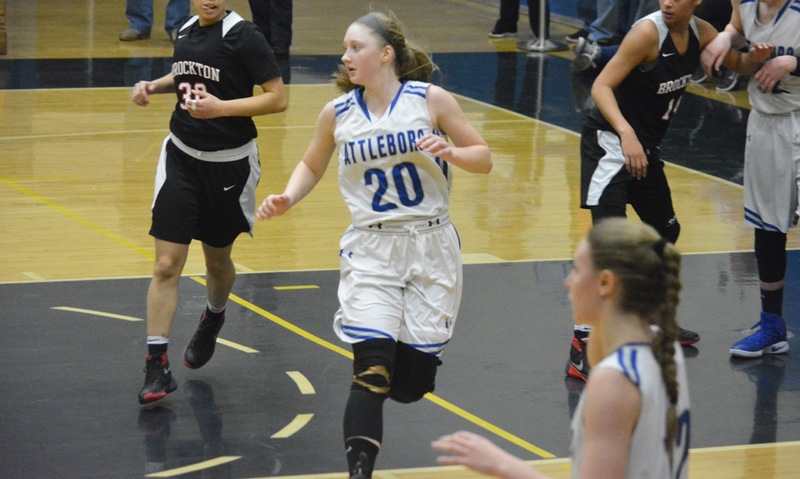 The teams traded baskets with Kim White (eight points) knocking down a jumper and Mish Logie and Jordyn Lako scoring on drives that gave Attleboro its last lead of the game at 21-19. Erin Daniel came off the bench to give Mansfield a spark, assisting on a Mady Bendanillo (eight points, nine rebounds) three and knocking down a long jumper to tie the game. After a Peel free throw, Ann Maher drove to the basket and Peel hit three from the line to close out the half with a six-point advantage. Attleboro hung around in the third quarter. Grace Mayer banked in a long jumper from a tough angle, Deyo scored on an offensive rebound, and Strachan hit her only shot from the field to cut the lead to 34-32. Mansfield saw Hill head to the bench with her fourth foul with five minutes remaining in the third, but the Bombardiers struggled to take advantage. Senior Olivia Broyles gave the Hornets a huge lift with a putback and, after Deyo got a three-point play, she scored on a layup off a Peel assist. Those were her only four points of the game, but Broyles also played an important role as a defensive substitute for Hill down the stretch. “The hidden hero of the game was Olivia Broyles, just playing unbelievable defense and rebounding when Meg got into some foul trouble,” said Redding. Maggie Danehy and Hill scored the opening four points of the fourth to give Mansfield a little cushion and then Peel put the game away for the Hornets with three-pointers on back-to-back possessions that extended the lead to 11 at 50-39. Mansfield (14-2, 12-1) can clinch the outright title on Friday night and avenge its only league loss of the season against Franklin. Attleboro (13-4, 9-4) will also look to avenge an earlier defeat and take control of second place in the division with a trip to Oliver Ames. ATTLEBORO, Mass. – Over the past couple of games, Foxboro has been able to turn to some of its supporting cast for big nights. Lily Sykes scored 19 in the win over Oliver Ames and on Sunday at the Dunkin’ Donuts Center it was Grace Tamulionis who stepped up with a career-high 20 points to beat Sharon. On Wednesday night at Attleboro, the now league-leading Warriors were able to turn to star Ashley Sampson. Not only did the junior guard scored a game-high 27 points and snag seven steals, but she also took turns guarding Bombardiers star forward Sarah Deyo. It was the kind of all-around performance that head coach Lisa Downs has been counting on from Sampson. Sampson’s big night helped Foxboro pull out a 58-46 victory over the Bombardiers and keep the Warriors in a first place tie with North Attleboro atop the Davenport division standings. Meanwhile, the defeat dropped Attleboro two games behind Mansfield in the Kelley-Rex. After the game, Downs called the first half defensive performance by the Warriors as their best of the season. Foxboro used its team speed, depth, and versatility to stymie the Bombardiers. The Warriors held Attleboro to just 17 points as a team in the half and held Samantha Pierce and Julia Strachan scoreless over the opening 16 minutes of play. Foxboro added Lauren Flahive to the starting lineup on Wednesday, going smaller but adding speed. It paid dividends immediately, as the Warriors used a 13-0 run to break the game open in the first quarter. Sampson scored seven in the first and Kristen Bortolotti added four. Tamulionis (team-high nine rebounds), fresh off her career-high on Sunday, buried a pair from beyond the arc for six of her 12 on the night. Deyo had four in the first and assisted on a three by Jordyn Lako to close out the quarter but the Bombardiers trailed by 12 points. Deyo, who finished with 15 points an 15 rebounds, added another six points in the second, but she was struggling to get the ball in good positions and four of her five baskets in the first half came from offensive rebounds. Sampson buried a three off a Shannon Smally kick out and then stole the ball from Deyo, who was also bringing the ball up the court at times, and went in for a layup. Sykes (10 points) drilled a three and it was a 31-17 lead at half for the visitors. Coming out of halftime, Attleboro started to pick up the pace and tried to cut into the lead, scoring as many points in the third as it had in the entire first half. Deyo twice got the ball at the rim for easy baskets, Grace Mayer (five points) buried a corner three, and Pierce (eight points) finally got going with four in the quarter. Foxboro held onto a double digit lead through the third thanks to eight more points by Sampson, including a baseline drive to the basket plus the foul that pushed the lead to as many as 17 points. Bortlotti (seven points) ended a mini-run by the Bombardiers to give Foxboro a 47-34 lead heading to the fourth. Attleboro gave the Warriors a scare in the fourth by scoring the opening eight points to cut the lead down to as little as five. Pierce had four of those points and Lako scored in transition from a Mish Logie assist. The home crowd was making noise and the bench was fired up, but the Warriors forced a pair of turnovers and took back control. After Sykes knocked down a couple of free throws, Sampson took the ball baseline and got to the rim and then on the next possession again got into the heart of the Attleboro defense for another layup that put Foxboro ahead 53-42. Sykes closed out the game going 5-of-8 from the line. This was a big win for Foxboro to stay level with the Rocketeers, which beat King Philip earlier in the night. Foxboro (10-2, 9-2) will look to extend its win streak to five games at Sharon on Friday. Attleboro (12-3, 8-3) will try to bounce back at home against King Philip. NORTH ATTLEBORO, Mass. – Trailing in the second half at home in front a packed crowd in the Kenneth Pickering Gym against rival Attleboro, the Rocketeers switched the defensive look to a 2-3 zone and turned the offense back over to senior forward Jonny Friberg and senior guard Brent Doherty. After scoring 11 points in the opening quarter, Friberg had seen far less of the ball after the Bombardiers turned up the defensive pressure on the North Attleboro guards and had managed only two points in the quarter and a half since. Meanwhile, Doherty was held in check with just six points midway through the third. That changed down the stretch. North started to pound the ball into the paint in the final 12 minutes and Friberg (10 rebounds) responded with 11 of his career-high 24 points and Doherty added 11 of his 17 as well, as the Rocketeers turned an eight-point deficit into a 62-55 victory that extended their win streak to four games and moved them into a tie with Milford for the Davenport division lead. In addition to the change of emphasis offensively, which included getting the ball into the post quickly to force the Attleboro defense to send help on Friberg, the Rocketeers also switch into a zone that slowed down the Bombardiers. North took control in the opening half by getting the ball into the block where Friberg used his size to overpower the Attleboro defense. He scored 11 of North’s 20 points in the first with a series of baskets from in close and then a three to close out the half off a feed by Kyle McCarthy. Despite Jake Dunkley’s seven points in the first, Attleboro trailed by six heading to the second. The lead grew to as many as 11 points (30-19), as Peterson drilled back-to-back threes and McCarthy came through with four of his six points. After a timeout, Attleboro turned things around with pressure defense by freshman Bryant Ciccio (seven points) and seniors Nate Douglas (12 points) and Lucas Boucicaut (four assists). Forcing turnovers allowed the Bombardiers to get in transition and they closed the half with a 10-0 run. Douglas scored twice on offensive rebounds and Ciccio and Dunkley each grabbed steals and layups. The run stretched to 14-0 and 19-3, as Attleboro turned the game around and built the lead to as many as eight points in the third quarter after Elvin Sam stole the ball from Friberg under the basket and fed it to Andrew Milliken (10 points) for the finish plus the foul. North started to creep back into the game thanks to its seniors. Friberg drilled a straightaway three to cut the lead to five and then added a fall-away jumper to make it 44-41. Milliken scored off a Dunkley assist to make it a five-point game heading to the fourth, but North had stemmed the tide. Doherty started the fourth with a basket in transition and, after a Friberg free throw, scored again on the break to tie it. Douglas knocked down a big three to put Attleboro back on top but it was answered by three at the line from Peterson. The junior guard then pulled up and the free throw line to give North its first lead since the opening minute of the third quarter. Friberg scored the next two baskets for North and the lead stretched to six. Attleboro tried to extend the game by crashing the boards and getting its chances at the line, but the Rocketeers closed out the game shooting 6-of-7 on free throws to earn the win. North Attleboro (8-4, 5-3) will travel to Mansfield on Friday before facing Milford in a battle for first in the division at the Dunkin’ Donuts Center in Providence on Sunday. Attleboro (8-5, 4-5) will try to put an end to its five-game skid (and help North) against Milford on Friday. NORTH ATTLEBORO, Mass. 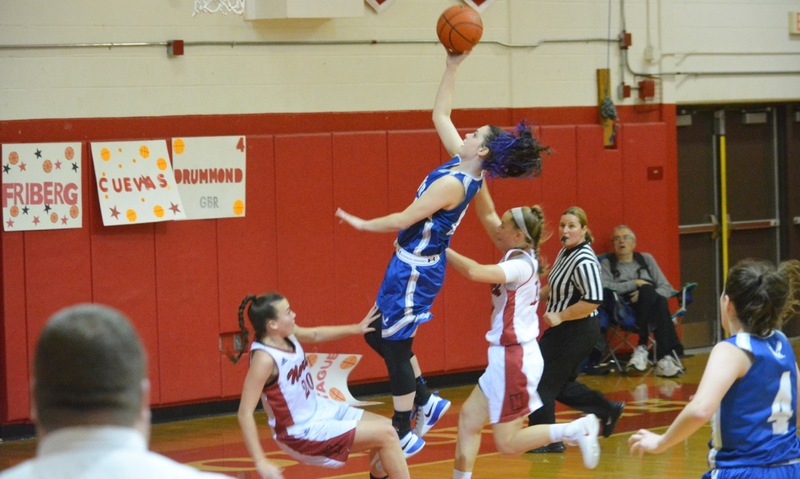 – In the opening game of a the basketball doubleheader at the Kenneth Pickering Gym, the Attleboro girls set aside the struggles of last week and put in a dominating performance to hand North Attleboro its first league loss of the season, 56-19. Senior Sarah Deyo led the way for the Bombardiers with another double-double of 22 points and 18 rebounds. She also added five blocks, as the Attleboro defense held North scoreless for the opening seven-plus minutes, allowed only two points in the first, gave up seven points in the opening half, and only 19 for the game. Deyo scored eight in the first and North did not get on the board until the closing minute when Caroline Collard knocked down a long jumper. Attleboro essentially put the game away with a 26-point second quarter, highlighted by Deyo scoring another six points and junior Sam Pierce scoring 11, including a deep three at the buzzer. Senior Julia Strachan marked her return to North Attleboro, where she transferred from after her sophomore year, with 12 points and Jordyn Lako chipped in with five. North was shorthanded on Tuesday night with senior guard Ashley Ahern ruled out due to injury. Julia Santos led the way with eight points, Samantha Taggart added five, and Collard had four points, nine rebounds and three blocks. Attleboro (11-2, 7-2) stayed one-game back of Mansfield in the race for the Kelley-Rex title and will travel to Milford on Friday. North Attleboro (10-3, 8-1) has a one-game lead on Milford and Foxboro in the Davenport and will host fellow league leader Mansfield on Friday.